If you want to know about the slip ring induction motor. This complete article is for you. Topics which are covered here: Slip ring induction motor application, construction, working principle, advantages and disadvantages, speed control of slip ring induction motor, the difference between Slip ring I.M and Squirrel cage I.M. If you want to add any further topic related to this article comment below we will add that topic soon! Brief content: Slip ring induction motor is induction motor where there is 3-phase winding on rotor and slip rings are connected with each phase winding. Slip ring Induction motor is also known as wound rotor induction motor. Slip ring motor has main two parts as we know: Stator and Rotor. The stationary part of the motor is called stator and rotary part of the motor is called rotor. The works of the stator is common in all motor to develop a magnetic field. The construction of slip ring induction motor is quite different compared to slip ring induction motor. Slip rings I.M provides some advantages like provides high starting torque, low starting current and it improves the power factor. We can add external variable resistance to the rotor of this type of motor. So, we can able to control the speed of this type of motor easily. >> Slip ring induction motor provides high starting torque. So, this motor is used in applications like Lifts, pumps, mills where we require high starting torque. Generally, induction motor provides low starting torque as compared to D.C series motors but this disadvantages of the induction motor can be overcome by slip ring induction motor. >> A slip ring is also used in applications where the load require good speed control. By the uses of slip ring in an induction motor, we can easily control the speed of induction motor by adding an external resistance to the rotor. Slip rings I.M provides some advantages like provides high starting torque, low starting current and it improves the power factor. >> A slip ring I.M motor can be used in several forms of adjustable speed drives. Some speed drives require to change its speed with several intervals of time so this type of motor can be helpful for that application. But Today speed control by use of slip ring motor is mostly superseded by induction motors with variable-frequency drives. >> These motors are suitable for loads requiring high starting torque and where a lower starting current is required. >> These Motors are Used for the loads which require a gradual buildup of torque. >> The Slip ring induction motors are used for loads which having high inertia, which results in higher energy losses. >> This motor is Used for the loads which require good speed control. >> These motors are used in conveyors, cranes, pumps, elevators, and compressors which requires high starting torque. You can check this – Single phase induction motor applications. The construction of slip ring induction motor is same as other induction motors. The stator has three phase winding on it. The main difference between slip ring induction motor is in rotor construction and usage. As it names Wound rotor, the rotor is wound with a 3 phase windings. Bar, straps or wires are used for winding. A large number of rotor turns will increase the secondary voltages and reduce the current that flows through slip rings. Each phase of winding is connected with the slip ring. These Slip rings are insulated from the rotor shaft. Rotor winding is always wound in 3 phase winding even when stator windings in 2 phase. 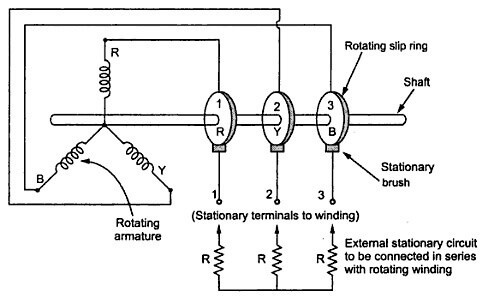 Rotor winding can be anything star or delta connected but In most cases, star connected rotor winding is preferred. Brushes are also connected with 3 phase star connected rotor winding. Slip rings are not used for transferring power but used for adding external resistance into rotor winding. Each motor has three slip rings which are mounted on the shaft but insulated from a shaft. The working principle of Slip ring I.M is same as the other induction motors. The poles of the stator are arranged in a manner that they create a rotating electromagnetic field when w gives A.C supply to the motor. The interplay of magnetic fields then forces the rotor to follow the moving field(s) of the stator. The stator of slip ring induction motor is same as the other induction motor. The rotor of the I.M is totally different from the squirrel cage rotor. In this type, the rotor has 3 phase star winding. Each phase winding is connected to the slip ring. The main reason for connecting the armature coils through slip rings rather than connecting them directly is to allow insertion of a variable resistor into the circuit. That permits control of the current induced in the armatures, giving variable control of the motor output. All slip rings are connected with variable resistance. By adding external resistance to rotor winding starting current will low but it has high starting torque. As the speed of the motor reaches its operating speed, rotor winding will be automatically short-circuited and external resistance will be cut-off from the winding. External resistance is only used for starting purpose. We can also control the speed of these motor by adding external resistance. >> Slip ring motors have high overloading capacity and smooth acceleration during heavy loads and no abnormal heating during starting. >> Speeds can be adjusted in the case of slip ring (wound rotor) induction motor So that they are considered as “variable speed motors” also. >> Initial and maintenance cost of these motor is high as compared to squirrel cage motor Because here in slip ring I.M, there is a three-phase winding on the rotor and in other hand squirrel cage has no winding on its rotor. >> Efficiency of slip ring I.M is lower than squirrel cage I.M. >> It has a lower power factor at light load. >> Sensitivity to fluctuations in supply voltage. 3. Easy for speed control. We can speed control by adding external rotor resistance 3. We can not any add external resistance in this motor. 7. Construction is complicated due to uses of brushes and slip rings which makes motor costly 7. Construction is simple and robust. It is cheap compared to slip ring induction motor. 9. Used where high starting torque required E.x – cranes, mining machines 9. Squirrel cage induction motor used in lathes, drilling machine, fan, blower printing machines etc. The new speed at which the pull-out-torque is desired, forms the input to the problem. For simplicity, here consider the case when pull-out-torque is needed at starting of the motor itself. here r can be measured by a multimeter. So basically through this example, we can say that resistance of value 9 times that of slip ring (wound) rotor resistance needs to be externally connected here to bring the benefit of maximum torque at starting. Hope now you fully understand about slip ring induction motor. 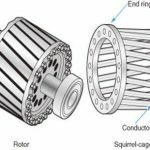 Squirrel cage induction motor provides low starting torque. To overcome this disadvantages of squirrel cage slip ring induction motor is used. Slip ring I.M provides high starting torque. We saw some of the applications of this motor. We can able to add external resistance through slip ring in the rotor circuit. So at the starting because of the high rotor resistance, we get low starting current which helps to start motor without any damage. After the starting of the motor external resistance will be cut-off and motor runs at normal condition. thanks for providing this complete article about slip ring ring induction motor. Really Enjoy sir.